There's nothing like a stop at a top-tier coffeehouse for a cup of fresh, quality coffee. But sadly, this luxury is often something restricted to city centers and random caffeinated oases. Suburbia is all but devoid of good coffee outfits. 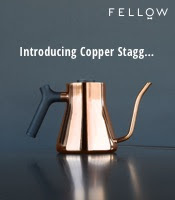 Thus, many a coffee geek has often been stuck in a bind where fast food or gas stations are but his/her only recourse for a cup of joe, a choice that often results in settling for "meh" coffee at best and, barely digestible swill at worst. But how the tide seems to be changing. Chick-fil-A, a fast food eatery barely known to even carry coffee, recently began a partnership with Thrive Farmers Coffee and S & D Coffee to bring direct trade coffee through the chicken-driven giant. Apparently working also with a few big names in the coffee industry like Tracy Allen, it seems Chick-fil-A was actually doing their due diligence to make sure that well-sourced coffee didn't end up losing the battle in the roasting and brewing processes. Only launching this new coffee today in a few test markets throughout the country, I was fortunate enough to live in one of them (Philadelphia/NJ) and hence, I got a call from a local marketing director to try out the coffee before it hit the streets. Showing up one afternoon, my eye caught a Wilbur Curtis pot brewer (was either a CBHS or ThermoPro G4) set up with digital timers set to expire after an hour of brewing (at which point, they dump the old coffee, clean and rebrew). While any tool can be misused, the equipment at least has potential to continually make good coffee. Center stage in this roll out is Chick-fil-A's new drip coffee. There was little information on the specifics of the origin that comprise the blend (region, farm, etc) but the fact that it's all Thrive Farmer beans at least narrows the scope. Coming piping hot in a sleeved paper cup, the drip coffee (after it cooled a bit) smacked of chocolate nibs, Oreos, sugar cookies, heavy cream, pretzel and slight basil, all within a medium body. The brew surprised me exceedingly, as it was bursting with sweet, luscious flavors and barely had any bitterness or displeasing aftertastes (a firm 4+ in my book). In addition, they are offering a cold brew iced coffee. Coming pre-concocted, simply needing to be diluted, the concentrate can be made with adding water or adding milk. Only wanting to try out the coffee black, I asked they just use water in making my iced coffee. Once again, I found myself impressed. Prominent notes of malt, vanilla and cream dominated this brew, with only a slight offset of romaine lettuce, proving overall smooth and rich. At this time, Chick-fil-A is leaving the question of espresso to another day, a move I find admirable, given the flippant attitude most other fast food giants give to the art of 'spro. 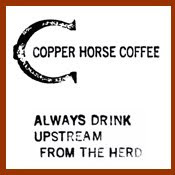 And with the rich quality and flavor that they have in their new drip and cold brew coffee, I think they need not rush. Thus, starting today, if you're in one of the test markets for this new brew, you can add Chick-fil-A to your list of places that serves decent coffee. Sure my preference is always for a cup of joe from a local, highly-reputed coffee establishment (i.e. those would be the 5+ and 6+ on my blog) but it's comforting to know that when I wander the coffee deserts of the country, Chick-fil-A has my back with responsibly-sourced and actually enjoyable coffee. Are they doing this in all of New Jersey or just selected restaurants? I am not sure of the entirety of the state; definitely the Philadelphia metropolitan area so if you're below 195, you are probably in luck. Give your local chain a call to be safe. That's awesome. I like Chic-fil-A but their coffee wasn't that great. I will start going there more often if they have developed that partnership with a reputable coffee company. Nice blog, and nice post. Ok, it is a cool product, but I think it is too expensive for a lot of people. bitter notes. I have had better. Definitely not the best coffee out there, but still a large step up. Mr. or Ms. Anonymous- The company name is spelled Chick-fil-A not "Chick-filet". The coffee, in my opinion such a huge step up and much better than any other fast food coffee offering. The flavors in the coffee were bold enough to be noticed but subtle enough to be enjoyed by a wide market of differing coffee preferences. I stopped at Chick-fil-a in Rockford, IL for a salad this week - which was, but the way, excellent - and they offered me the free coffee. It was VERY good. The only coffee that I have had that came close was Douwe Egbert on an AmTrak trip. Far better than a Starbucks. I will be back! Had the vanilla iced coffee in Grapevine, TX this am it's great! Went to Chick-fil-a today for some iced coffee. It was fantastic! I'll will be back! I have tried the iced coffee at 4 of the CFAs in the Birmingham area and it is consistently great. I think your rating is low. Hope that's not just because it isn't a local coffee shop. It is honestly better than iced coffee I've had at local and SB shops. This coffee is not priceyJohn Milles. It's $2.15 for a large and only $1.65 for a small. Thats a fraction of the price for a lot of coffee places, especially Starbucks, and it tastes a heck of a lot better. Plus the coffee comes from a great place giving the poor coffee farmers 10 times more money than most other companies. I love this coffee! 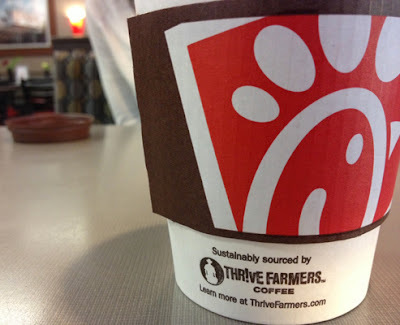 Drinking Thrive Farmers Coffee from Chi-fil-A right now. Not a fan.